The food on our great-grandchildren’s table should be as good as the food on our great-grandparents’ table. That’s why Long Table sources ingredients whenever possible from farmers and millers local to Chicago who grow and mill healthy grains with sustainable practices. It reduces the carbon footprint of your breakfast, and it helps preserve local small farms and heritage grains. When we can’t get something locally (not everything grows in the midwest), we will always source from companies who are squarely and honestly addressing the complex ethical and environmental issues facing the food industry. We invite you to learn more about the grains and meals we use in our cakes, and about the farmers and millers who grow and grind them. WI County Road C, on the way into Lone Rock, in the Driftless Area of WI. Our organic whole grain blue corn is grown by Dave Dolan in Dodgeville WI. It is milled at Lonesome Stone Mill, in Lone Rock WI. Blue Corn is one of America's most ancient grains. Long cultivated by the Hopi Indians in what is now Arizona and New Mexico, ours has been adapted to the midwest climate through careful seed-selection. Blue corn has a distinctively dry, mildly sweet flavor. Our whole grain rye is grown by Larry Dammen near Argyle, WI. It is stone-milled at Lonesome Stone Mill, in Lone Rock WI. Rye is an ancient grain originating in central Europe. We join artisan bakers and whisky distillers in our love of its earthy, subtly spicy character. Our whole grain popcorn is a red varietal grown by Andrew and Karlie Bowman of Pilot Knob farm, in Oneida IL. We air-pop and stone-mill it in small batches in-house. Popcorn was milled into flour during WWII, when wheat became scarce. Apart from the humble kitchen blender, the practice has since been lost. We had to Rube-Goldberg together three different machines to bring you stone-ground popcorn flour. It lends a strikingly light and airy quality to pancakes. Its flavor is unmistakable and distinct, especially when buttered. Our whole grain soft red winter wheat is grown by Terry Sprecher, of rural Lone Rock, Richmond Co, WI. It is stone-milled at Lonesome Stone Mill, in Lone Rock WI. Most "white" flour has been deconstructed, bleached, and reconstructed with artificial replacements for the nutrients lost in the stressful process. Our soft red winter wheat has nothing removed and nothing added. Grown especially as a pastry flour, the whole wheat berries are then stone-milled, losing none of the naturally occurring nutrients. It is lower in gluten than "all-purpose" flour, and is perfectly suited to pancakes. Our organic whole grain oats are grown and milled on the farm at Brian Severson Farms. Originally cultivated from a wild weed, oats lend baked goods sweet, round, vanilla-like flavors, and a light, delicate crumb. Almonds do not grow well in the midwest. Our almond meal is made from whole, unblanched almonds grown in California and stone-milled by Hodgson Mill in Effingham IL. Almond meal is good friend to every pastry' chef. Rich in flavors and very light in texture, almond meal lends a rich, buttery flavor to our cakes. Our organic whole grain dark buckwheat is currently grown in the pacific northwest, and stone-milled by Bob's Red Mill in Milwaukie OR. We are looking for a suitable local varietal. Buckwheat is a seed, not a wheat. Early European-Americans used it widely in their hearty, yeasted pancakes. Known for its distinctively nutty, slightly bitter taste, it also lends a satisfyingly toothsome quality to our cakes. Maple syrup is its perfect companion. Our Teff is grown in the snake river valley of Idaho, by Maskal Teff. Founded by Wayne Carlson, the first person to successfully grow Teff in the United States. Teff, a small seed, is the staple grain of Ethiopia; typically made into sour, spongy Injera bread. Devilishly difficult to harvest, we're glad they've mastered it in Idaho. We use un-milled, whole grain teff seeds for a delicate crunch, rich buttery flavor, and incredible nutritional value. Hazelnuts are not widely grown in the midwest. 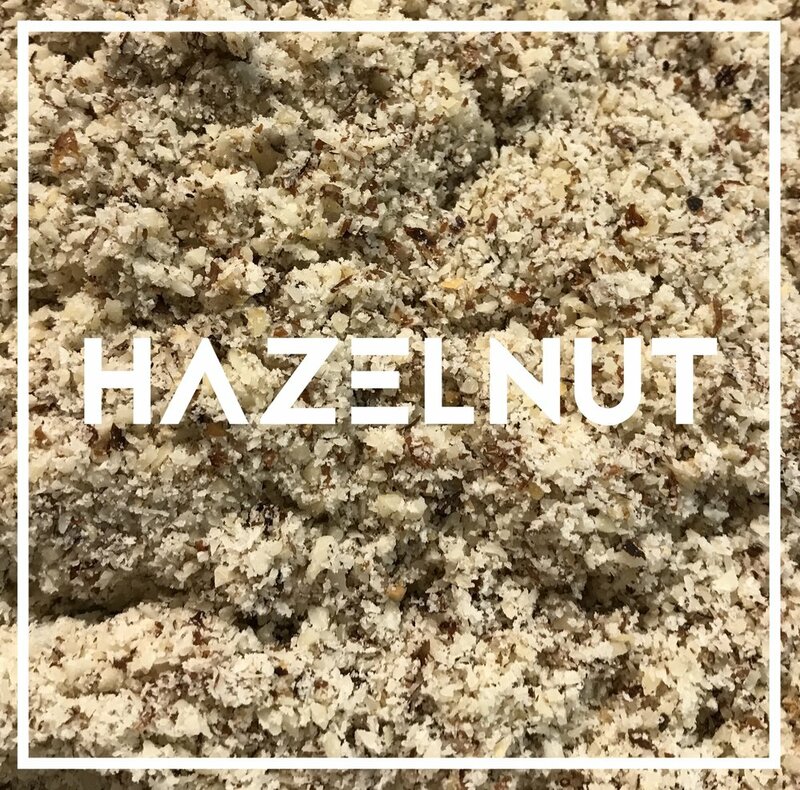 Our hazelnut meal is made from hazelnuts grown on orchards in Oregon's Willamette Valley, where 99% of the United States' hazelnuts are grown. They are milled by Northwest Hazelnut. Hazelnuts are often added to cookies and chocolates for their crumbly texture and rich flavor. They are the perfect addition to a tender high-protein breakfast cake that won't quit before lunch. Our Sorghum is grown by family farmers within about 70 miles of Effingham, IL, where they are stone milled at Hodgson Mill. Sorghum (also called Shattercane, broomcorn, and Sudan grass) is an ancient grain, cultivated in Northeastern Africa for more than 10,000 years. In the United States, Benjamin Franklin gave seeds to his friends, because it made excellent bread and unparalleled thatching. We use it for its mild, silky sweetness.